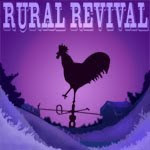 Rural Revival: Celebrating: A Cause for a Giveaway! Celebrating: A Cause for a Giveaway! 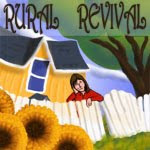 In celebration of Rural Revival's first anniversary, I asked the Artist to work some of his magic and boy did he ever! In between countless trips to the woodshed, baby, it's been cold here! and shoveling the pond to keep it smooth, he designed a new button for 'the blog'. Actually, he created two. 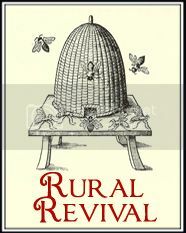 We're curious to know which one is your favourite; and in order for you to tell us, Rural Revival is offering it's first giveaway! I've been on a eco-friendly and practical living kick lately, mainly because of these two books. Jayme from Tales from the Coop Keeper, tipped me off about Made from Scratch by Jenna Wingerich. At the ripe young age of twenty-six, this girl could survive in the old farmhouse, if you plopped her down in it when it was first built in the 1860's, and she could do it alone. 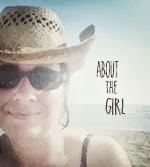 From raising rabbits, beekeeping, sewing her own clothes, and mushing with her two sled dogs, even making her own music with the fiddle, she has learned how to be self sufficient while still working full time. I am certainly envious, but also very inspired. I'm not done fighting with that sewing machine just yet and let's just say having livestock is one of my new year's resolutions, but that's for another day. 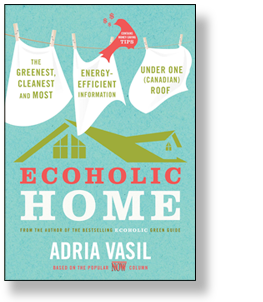 My other new fave is Ecoholic Home by Adria Vasil. I had a copy from you know where and I ranted and raved it about it so much, the twins gave me my very own copy for Christmas. 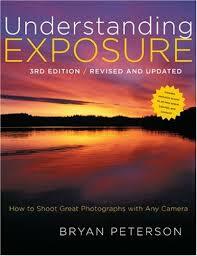 This book is informative, eye-opening and a handy dandy tool to boot. From the chemicals used in cleaning supplies...a no brainer for most of us these days to the fire retardant cancer causing chemicals on draperies, upholstery, sheets and um, pillow cases that we rest our noggins on each and every night, news to me; she gives the lowdown on what really is IN the stuff we buy and what it's doing to us. She also gives alternatives, providing test results and ratings on eco-friendly products and lots of websites and information on where to buy healthy and harmonious with the earth products. 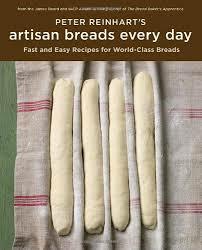 I will never, ever buy anything again without consulting this book first. Of course, my copy is the Canadian version, but never fear there is a US version too! So here's the short and sweet on the giveaway. If you would kindly leave me a comment and vote for the button of your preference, you will be entered to win the book of your choice. If you are a follower, leave me a second comment, just cause I always love hearing from you and you will be entered a second time. Should you feel compelled to do your bit to help save the planet because our children's children's children are counting on us, and you post about this giveaway on your blog, let me know by way of a comment and you will be entered again. So there you have it, three chances to win; I think the odds are very good on this one. Act now, don't delay! If you are not a follower, make sure I have a way of contacting you should you be the lucky winner, please and thank you kindly! 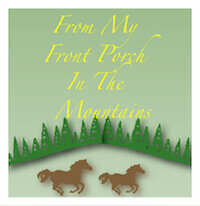 For those of you who may not know, ahem, like my Mom, you don't have to have a blog to be a follower. Go here for a quick video on how to follow. Although, correct me if I'm wrong, you do need a google or yahoo email account which I personally couldn't live without but some folk still like email tied to their PC. Mom, we seriously have to work on this! Love ya! Lastly, I'm going to leave this open for awhile, I will draw the winner this Saturday morning after I've had my morning coffee! That;s a hard decision. I love the little picket fence and you leaning over it. But there is soemthing aboout the colors of the rooster on purple that I really love. So my vote is the Rooster! And yes, I'm a follower. Tell the artist he did GOOD! I vote for you leaning on the fence. Praise for the artist, it was a difficult choice (love that purple). Don't enter me in the draw though (relatives are excluded), and yes, we do need to work on that email thing - and who knows? maybe I'll even start my own blog! A difficult choice for sure, but my vote is for the second one. I like the brighter colours and that your farmhouse is included. I'm a follower too, and wondering what animals you are considering. Sounds exciting. Hi Andrea. The artist did a great job! I really like the second one because of the colors and it's just unique! I'm a follower too and I love reading about what is happening at your farmhouse. I look forward to more in 2010. I vote for the 2nd one too although Roosters are supposed to be lucky and purple is my favourite colour but it just reminds me of you! The artist did do a fantastic job on both of them though! 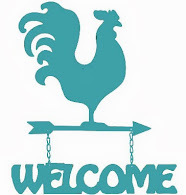 I have been reading your blog since day one but I guess I am not "an official follower" as I didn't know that you could be one without having a blog either...better late than never (at least you can easily find me, if need be)! Honestly, I didn’t know that I could post a comment either...sorry, I’m new at this but you gotta love me, right?? Thank goodness for your wonderful blog...I always look forward to reading it as you have such a way with words, putting them all together, making them flow and keeping it so interesting! You're truly inspiring!!! Happy 1st Anniversary...you've come a long way...keep up the amazing work! The Artist really went all out! Love them both. I do like the one with YOU in it (is that you? very cute!). But the rooster too. Hhmmm... It's a tough one but the one with you and house is my pick. The second one makes me awfully happy! Pick that one! Going to follow you now, and put you on my sidebar, have no idea why you aren't there already! I vote for the purple rooster and I'm following your blog. Andrea: I hope I'm not too late to join in. I love the first button because of the intense color. I think Canada is so beautiful; and I think the colors of this button are beautiful, too. I can feel for you about the septic issues! On the first day of viewing when my dad passed away, we were late leaving for the funeral home as we had to wait for the truck to clean out our tank. Gotta love that rural living!!! Oh boy am I sorry I missed this! But I've got a perfectly good amazon.com gift card lying around and I think I found the perfect book to spend it on! 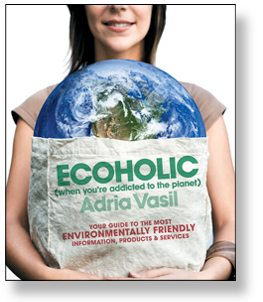 Ecoholic sounds perfect for me!